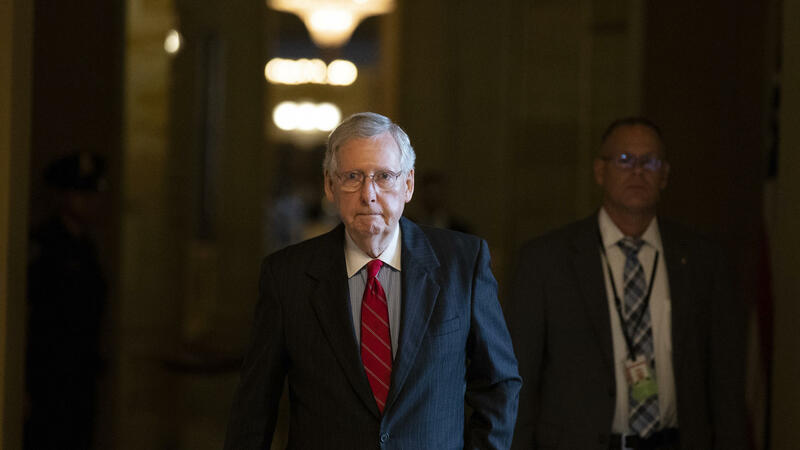 Senate Majority Leader Mitch McConnell of Kentucky walks to the Senate floor for a vote on Thursday. Senate Majority Leader Mitch McConnell has a message for Republican voters who are celebrating the confirmation of Supreme Court Justice Brett Kavanaugh: Get to the polls in November if you want more conservatives sitting on judicial benches. "Lose the Senate, and the project of confirming judges is over for the last two years of President Trump," McConnell said in an interview with NPR in his Capitol Hill office. "That, I think, is a scary prospect to the people who like what we've been doing on the judge project and I hope will help us hold on to our majority." McConnell said the raucous, sometimes aggressive fight over Kavanaugh's nomination came at a perfect time for Republicans. Polls showed GOP voter enthusiasm slumping over the summer as energy for Democrats spiked. All that turned around when Republicans grew frustrated with the protracted battle over Kavanaugh. The Kentucky Republican said it awakened them to the Supreme Court cause — an issue that inspired many of the same voters to back Trump in 2016. "As of the last week or so the hottest issue in our races has [been the] Kavanaugh nomination," McConnell said, even outpacing tax reform, which the top Senate leader listed as a major legislative accomplishment. "We knew the Democrats were fired up. They have been all year. No question about that." "But what we are now seeing is that the enthusiasm and energy on the Republican side comes close to matching the Democratic side, and given the states that we're competing in, that's really good news for us," he said. McConnell also called activists opposing Kavanaugh a "mob" and criticized Democrats for encouraging their actions. He said Republicans were inundated with protesters in recent weeks and had their lives disrupted. "We were literally under assault ourselves," McConnell said. "Trailing members for their homes; getting in their faces here in the Capitol. An effort clearly to try and intimidate us. And one of the reasons I was so proud of the result last Saturday on Judge Kavanaugh is that we stood up for two things. We stood up to the mob and we also stood up for the presumption of innocence in this country." He also rejected any comparison between those protesters and the conservative Tea Party activists who protested the 2010 passage of the Affordable Care Act or the raucous crowds that chant "lock her up" and jeer at reporters at many of Trump's own campaign rallies. Democrats say the Kavanaugh fight was equally energizing for their voters and for women in particular. At the same time, Republicans are losing support among women in addition to already low numbers among Hispanic and African-American voters. "We've always had something of a gender gap," McConnell said. "It's never been as wide as it is now." He said he hopes electing qualified women to the Senate, like Marsha Blackburn in Tennessee and Martha McSally in Arizona, will help close that divide. He also pointed to Hispanic Republicans like Sens. Ted Cruz, R-Texas, and Marco Rubio, R-Fla., as evidence of diversity within the GOP ranks, but he noted that attracting black voters has been a bigger challenge. "I think we can improve our position with women voters and with Hispanic voters for sure," he said. "With African-Americans, we haven't been able to make much headway." He did point to Sen. Tim Scott, the first African-American senator elected in South Carolina, as a "noteworthy" addition to the GOP conference. "He's arguably the most popular politician in South Carolina," McConnell said. "So there is hope with African-American voters as well. But I'm more optimistic about closing the gender gap and by improving our position with Hispanics." Several key issues Republicans once touted as the central themes for the midterm elections have faded in recent weeks. McConnell says tax reform remains one of his top accomplishments, despite the fact that it is playing a smaller role in campaigns this year, and has been eclipsed by the Supreme Court debate. The GOP message on health care has also shifted. Gone are the days of candidates vowing to repeal and replace the Affordable Care Act. Now Republicans are actively embracing protections for people with pre-existing conditions — a central tenet of the law they all opposed. McConnell said many Republicans are explicitly vowing to keep those protections, even as two GOP Senate candidates, Missouri Attorney General Josh Hawley and West Virginia Attorney General Patrick Morrisey, are suing to weaken consumer protection provisions in the health care law. "Every one of our candidates have been able to respond to it by saying that they are in favor of making sure that people with pre-existing conditions are covered," McConnell said. "You can favor the lawsuit and still be in favor of maintaining coverage or adjusting conditions." McConnell sidestepped whether Republicans would take another run at rolling back Obamacare next year after failing to get the votes for their scaled down repeal legislation. He called that failed effort "the single biggest disappointment this Congress and really the only major disappointment" after moving bills through "on so many different fronts." The top Senate Republican distanced himself from the unusual public criticism that President Trump leveled of the Federal Reserve Bank's economic policies. Trump said the Fed had "gone crazy" for raising interest rates. McConnell instead said of his own posture on monetary policy, "I generally avoid commenting on the market. It goes up and it goes down. Or giving the Fed advice." Back here in Washington, Senate Majority Leader Mitch McConnell is sending a warning to voters. With midterm elections now just 26 days away, he wants Republicans to know control of Congress is not the only thing at stake. MITCH MCCONNELL: Lose the Senate, and the project of confirming judges is over for the last two years of president Trump. That I think is a scary prospect to the people who like what we've been doing on the judge project and I hope will help us hold onto our majority. KELLY: Well, NPR congressional reporter Kelsey Snell sat down with Senator McConnell in his office in the Capitol today for a wide-ranging discussion, and she is with me now for a wide-ranging discussion on everything that they discussed. Hey there, Kelsey. KELLY: So Senator McConnell really sounding the alarm there for Republicans - how confident did he tell you he is that they will keep their Senate majority come November? SNELL: Well, I have to say he sounded much more upbeat than he did even just a month ago. People may remember that earlier this year, he said the Senate was absolutely in play. Now, the conversation we had didn't really sound like that. He told me that the fight over Kavanaugh - Justice Kavanaugh came just at the right time even when he was downplaying the general failure of the tax reform message for Republicans. MCCONNELL: As of the last week or so, the hottest issue in our races has become the Kavanaugh nomination. And we've seen a surge in interest among Republican voters. We knew the Democrats were fired up. They have been all year - no question about that. But what we're now seeing is that the enthusiasm and energy on the Republican side comes close to matching the Democratic side. And given the states that we're competing in, that's really good news for us. SNELL: You've said many times that it - to energize your base. Do you worry that that has come too quickly? Is that something sustainable? Will Republicans - now that they have Kavanaugh in this seat, will they stay energized and show up to vote? MCCONNELL: Actually it comes right on the eve of the election. I mean, we're only three weeks out. The timing for a surge really couldn't have been better - not that this was all planned, you understand. But, I mean, it was a great break for us in terms of energizing our own people. SNELL: Another part of it that you've talked about is you've called Democrats an angry mob essentially. You've used the term mob. MCCONNELL: I declared the mob an angry mob. That was not what I said about our Democratic colleagues. I do think that they encouraged what went on and that Congress - well, you were here in the halls. We were literally under assault ourselves - trailing members to their homes, getting in their faces here in the Capitol, effort to clearly try to intimidate us. And one of the reasons I was so proud of the result last Saturday on Judge Kavanaugh is that we stood up for two things. We stood up to the mob, and we also stood up for the presumption of innocence. SNELL: One major campaign promise that you guys were not able to fulfill was on health care. And I'd like to know. Would you schedule a vote to repeal the Affordable Care Act if you do keep the majority next year? MCCONNELL: I usually don't announce what I'm going to do this far in advance. That was a disappointment. That was the single biggest disappointment of this Congress and really the only major disappointment. We were able to move on so many different fronts. In fact, if you're an American who prefers the country right of center, I've said before, and I would say again today this has been the best Congress in the time I've been in the Senate. SNELL: You've acknowledged that your party has a significant gender gap. It's something you've talked about quite a bit in the past couple of days. Republicans are also behind with minorities and some other groups. What does it mean for the long-term viability of the GOP if the party increasingly appeals mostly to white men? MCCONNELL: Well, you know, we've done pretty well with Hispanics in the past. And even the current president did better than a lot of people thought he would. I think it's also important to remember that President Trump got 9 out of 10 Republican votes in 2016, not that every one of those 9 out of 10 who voted for him was thrilled with every aspect of what he was saying. I think we're in a pretty good position going into these midterm elections. I'm pretty optimistic we'll be able to hold our majority. SNELL: There was a talk at one point in time about, you know, dissecting where these losses were happening for Republicans, particularly in the Hispanic community. Is it time for that to happen again? MCCONNELL: Well, I don't think there's any question that we would like to be doing better than we are with Hispanic Americans, although some of the most prominent Hispanic politicians in America happen to be Republicans. With regard to women voters, we've always had something of a gender gap. It's never been as wide as it is now. We have two great women running for the Senate this year, Marsha Blackburn in Tennessee and Martha McSally in Arizona. I think we can improve our position with women voters and with Hispanic voters for sure. With African-Americans, we haven't been able to make much headway, although I think it is noteworthy that Tim Scott is a member of our conference. And he's the - arguably the most popular politician in South Carolina. So there is hope with African-American voters as well. But I'm more optimistic about closing the gender gap and by improving our position with Hispanics. SNELL: You're looking ahead. We talked just, like, 3 1/2 weeks away from this election. How many Republicans will be in the Senate next year? MCCONNELL: Now, you know I'm not going to answer that. MCCONNELL: I stay out of the prediction business. KELLY: Sometimes the non-answers are telling. That was Senate Majority Leader Mitch McConnell speaking with our Kelsey Snell on Capitol Hill today. And, Kelsey, was there anything else he just wouldn't answer? SNELL: Well, yeah, I think it's important to note that this is a longer interview that we kind of had to edit down for time. And he and I talked about a lot. And one of the things he - that really struck me is that he avoided criticizing President Trump on most issues, particularly on the economy and on President Trump's comments from last night that the Fed is crazy for raising interest rates. SNELL: McConnell just wouldn't go there. And in that section about health care, when we heard him say it was a major failure, he didn't say it's a fight he wants to repeat. And that's not what a lot of conservatives want to hear. They wanted to hear that Republicans are going to go back if they still have control and try again to repeal the Affordable Care Act. And on that same issue, we got into an extended conversation about Republicans and protections for people with pre-existing conditions. Two Senate candidates are involved in lawsuits to weaken those protections, and he told me that Republicans are campaigning on keeping those protections and gave a contradictory response about how they can support those lawsuits but still want the protections in place. KELLY: One thing that leapt out at me listening there - back to your health care point, he described a failure to pass health care overhaul is the only major disappointment. And I was thinking, I can think of others. I mean, what about comprehensive immigration reform? They wanted to get that done. It's not done. SNELL: That really wasn't on his list. And, you know, I - it has been on the list for a lot of Republicans that I've talked to who had worked on immigration. Many of them said that they still hold out hope that immigration could be part of a broader conversation later in the year, potentially around spending. KELLY: Speaking of spending and speaking of immigration, did you ask about the border wall, which people are talking about again - funding for Trump's border wall with Mexico? SNELL: Yeah, I asked him if he thought there was going to be a shutdown fight in December over the border wall with Mexico. He says he wants to try to get funding for the wall, but he's talking about a lot less money than House Republicans. He said about - you know, money for about one year, roughly the amount that they've been spending on border security altogether. And now, that's not a big down payment or major investment that some in the House are talking about, and that sets up the possibility of an immigration conversation, of a big spending fight. KELLY: One other thing that you raised with him was women and where women are left post-Kavanaugh confirmation battle. He acknowledged that there's always been something of a gender gap in terms of voters for Republicans and acknowledge that's going to be a challenge. SNELL: Yeah, absolutely. And he said that he is going to make an effort to get more women on the Senate Judiciary Committee next year. He says he's asked in the past, and he's going to ask again. KELLY: All right, NPR congressional reporter Kelsey Snell talking about her interview today with Mitch McConnell there on Capitol Hill - Kelsey, thanks so much.